Elevated between 0 ft and 4846 ft, the Ski Resort is the highest elevated Ski Resorts in Sweden. The vertical drop from summit to base is 4846 ft. The average difference in altitude between base and summit of Ski Resorts in Sweden is 1099 ft. Most runs are therefore relatively long. The ski resort is the ski resort with the best snow conditions in Sweden. 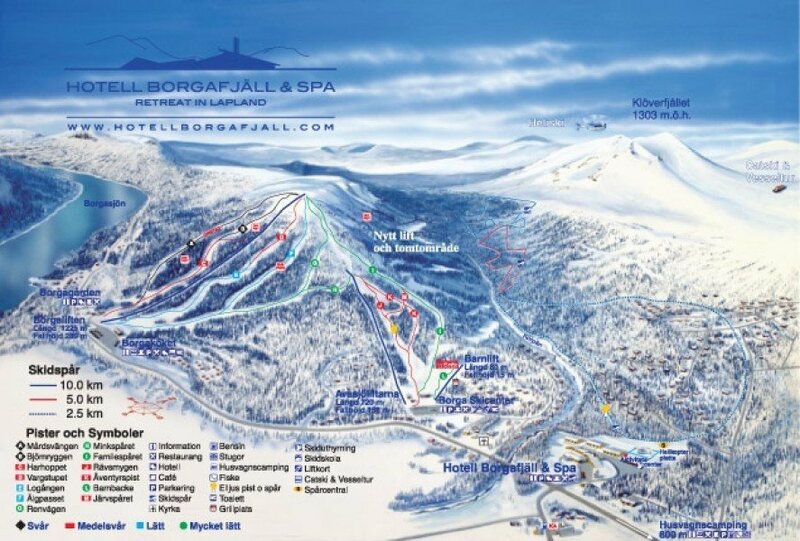 Borgafjäll is a skiresort hosted by a hotel with spa-area in southern Lapland. The resort comes with 13 kilometers of ski-runs with different levels of difficulty. After a long day on the runs, you can enjoy with a massage, or in the pools and saunas. For more action you can join activities like snowmobile-riding, dog-sledging, riding or horse-sledging or heliskiing. Some more realxing activities? You can also go cross-country skiing, hiking or fishing like the old Sámi used to.